Goodreads synopsis: “A line that should never be crossed is about to be breached. This book is so much more that what you read in the synopsis or what Throne of Glass was. It got darker and twistier and so much more complex! It is turning out to be quite the epic tale as, dare ibsay, Game of Thrones is! It’s not quite that big yet on the 1 to Game of Thrones level of epicness but Crown of Midnight definetly inched it that much closer! The story still follows are main 3 characters: Celeana, Chaol, and Dorian. 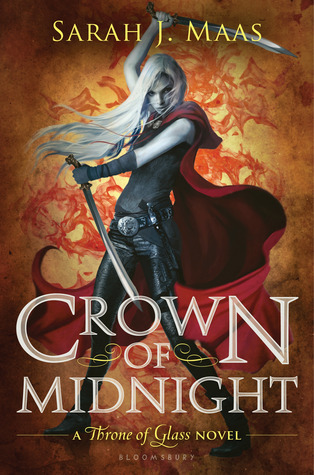 Celeana becomes even more badass in this book if that’s even possible. She is now deep into doing the king’s dirty business and is showing the world just how lethal and awesome Adarlan’s assassin can be! Dorian got a lot cooler in this one as well. I obviously can’t tell you because it will spoil a major plot line but his character is way more deep than just the handsome price you see on the surface. I am anxious to see where his storyline goes. As for Chaol. Oh Chaol. I do love him but the boy made some poor decisions in this book that cost him dearly. He makes one horrid decision which costs him and he pays for dearly. He then gets a little redemption from it and I think we can probably move on. But then the ending. His poorest decision yet and since I have not started the 3rd book I do not know how deadly this mistake will cost him. I found the bits where Chaol and some other characters were butting heads (to put it mildly) difficult to read as he is one of my favorite characters. I hated seeing him go down this path of destruction. But I still love him as a character and do believe he has a good heart so I will be willing to bet we will see some redemption for good ol’ Chaol in Heir of Fire. This was a great sequel to the first and the story just keep growing and getting juicer and juicer. I can’t wait to see what Heir of Fire has in store for me! If you aren’t reading this series, you need to be! One word best sums it up: EPIC!